Y'all, the Hill House is rejoicing the arrival of springtime! There's nothing quite so wonderful as early morning sun, the chitter chatter of chirping birds, fresh flowers, and open windows. If I didn't love fall so much, spring would easily be my favorite. I just adore this time of year. Even though it's spring, the temperatures aren't quite up in Virginia. So while I am gearing our dinner menus to reflect those spring feels, I'm still sneaking in some cozy meals. And there's no better way to fix this type of dish than in the crock pot where prep is minimal and the slow cooker does all the work. I think you absolutely must add this to your meal list. 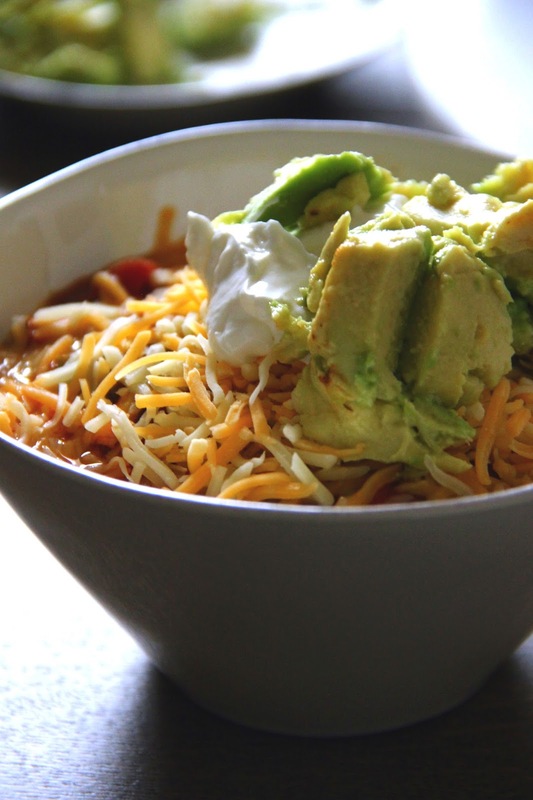 BECAUSE, THERE'S FRESH AVOCADO ON TOP, AND YOU WILL NEVER EAT YOUR CHILI THE SAME. It's that life-changing. Of course, there's sour cream too. And the combo of those two with a spicy bite from the chili is perfection. Now let's get to making some scrumptious chili! Brown the beef, draining off the excess fat. Add the diced onion to the skillet and cook until tender. In a crock pot, add the diced tomatoes, kidney beans, chicken broth, and all of the spices. Throw in the diced green peppers. Next add the browned beef and onion. Cook on high for 3.5 to 4 hours. At approximately 3 hours, add the corn. Serve hot, topped with chunks of avocado, dollops of sour cream, and a sprinkling of cheese. **you can cook the beef and onion ahead of time, storing in the fridge for several days until you are ready to make the chili.